Geology Flood plain of the ravine of the River Greta. Record Name The remains of the Old Church of St Mary's Church, Brignall and evidence for Pre-Conquest Christian Oratory and Graveyard on the site of Roman and Celtic Shrines. Record Description The purpose of this record is to draw attention to the presence of the romantic ruins of the Old Church of St Mary of Brignall located close to the River Greta far below the Village. 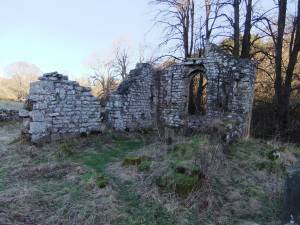 Secondly attention will be drawn to the evidence for the existence of an earlier Pre-Conquest Christian Oratory or Church, and Graveyard occupying the location of a yet much earlier Roman and Celtic Shrine. 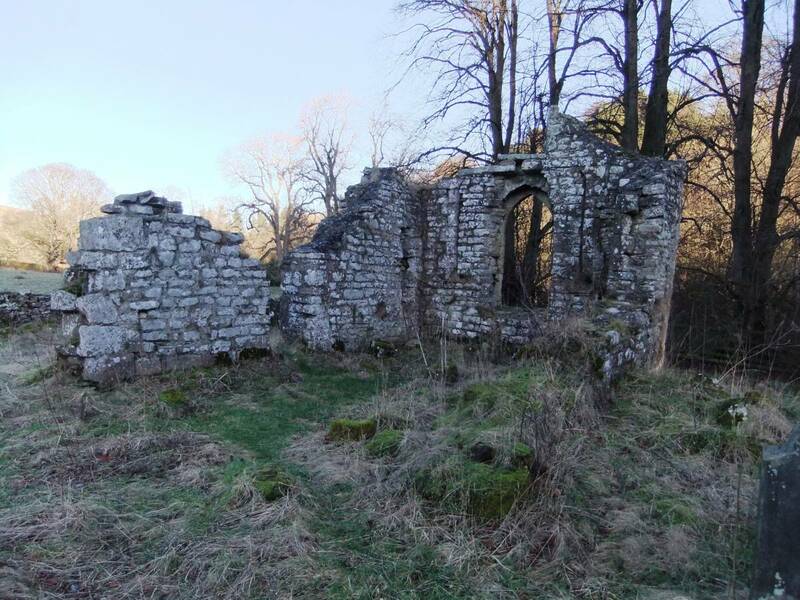 The historical evidence for the appearance and historical development of the Old Church is vividly described by the late Dennis Coggins with Ken Fairless in their summary of recent consolidation work to clear vegetation and trees from the Graveyard and from the remaining masonry of the Old Church during 1986/7. Reference: Durham Archaeological Journal,17,2003,25-41. 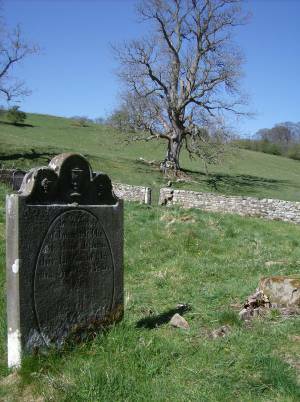 The historical development as understood from earlier accounts, notably: Victoria County History, North Riding of Yorkshire together with evidence for pre-Christian activities at the riverside location of the Old Church of St Mary's, Brignall as detailed by Dennis Coggins and Ken Fairless, 2003,can briefly be summarised, as follows: Date 1833 The Old Church abandoned and demolished. Masonry from the demolitions reused in the building of the present Church close to the Village. 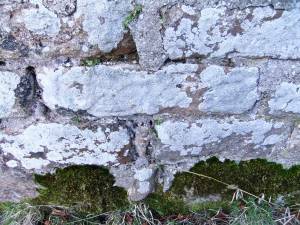 1780 Churchyard enclosing wall 16th to 18thC. The 13thC church remodelled with three lancet windows in the East Gable replaced by a square headed four light window. 13thC. Probable date of the construction of the Old Church. 12th-11thC Three incised grave markers forming cills or lintols to the earlier lancet windows attributed to this period point to the existence of an earlier church on or close to the 13thC church. 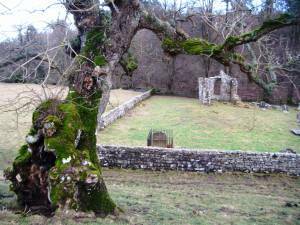 10thC and earlier Pre-Conquest Christian activities. 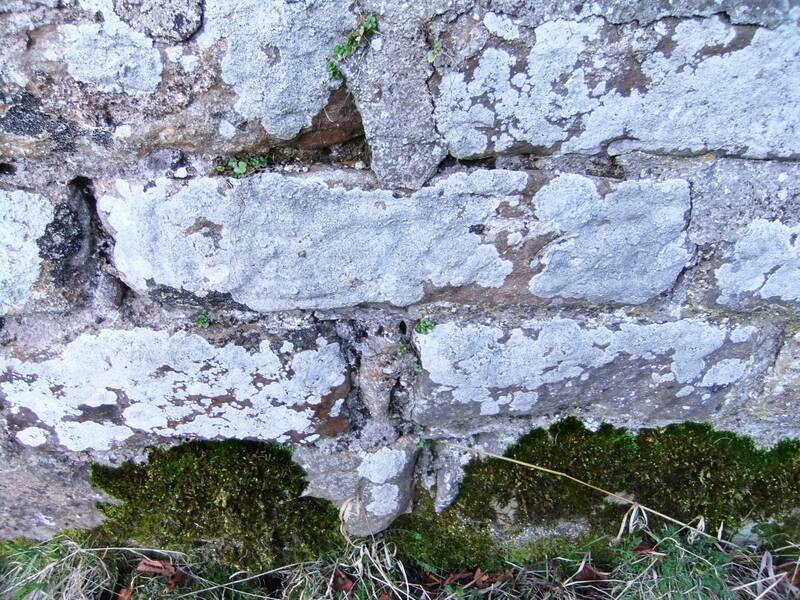 The presence of a interlace decorated fragment of a cross shaft built into the North Wall of the Chancel points to the existence of an Early Pre-Conquest Christian Oratory, or similar timber structure. This conclusion is strengthened by the recognition by Coggins and Fairless of low curving earthen banks outside the present rectangular churchyard wall together with a sunken area which could be the site of a timber structure. The resistivity survey by Coggins and Fairless of part of the interior of this earlier enclosure seems to indicate the existence of a pre-existing church/oratory and confirms the curvilinear enclosing bank. Three Roman Altars have been recognised at the Old Church, one of which is in the Richmond Museum the other two (possible) altars are reused as grave headstones. These altars provide evidence for the presence of a Roman and possibly also an earlier Celtic Shrine on the bank of the River Greta, perhaps dedicated to the River Goddess Nymph, similar to the altar dedicated to her recorded from the Roman Fort at Greta Bridge riverside shrine on the south bank of the Tees, at Rokeby, located some 300m downstream of the Meeting of the Waters. The above is no substitute for reading the very detailed and illustrated account by Coggins and Fairless: Durham Archaeological Journal,17. 2003, 25-41. Additional Notes The only available extant image of Old Church of St Mary, Brignall in the landscape of the River Greta is an etching by S Rawle of the lost watercolour by J.M.W. Turner of Brignall Church. The original watercolour by Turner was lost in a fire some 100 years ago. This etching is reproduced in the excellent finely illustrated account of J.M.W. Turner's visit and tour of Yorkshire, reference: David Hill, 1984. 'In Turner's Footsteps: Through the hills and dales of Northern England.' John Murray(Publishers)Ltd. Figure 68, p71. 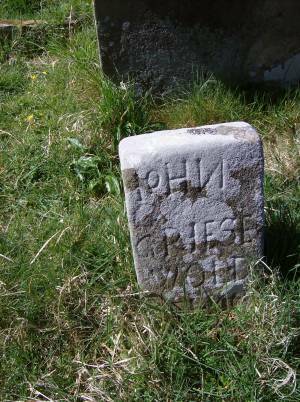 Record Update: Caption to Photo No 7: Small headstone, undecipherable (by Me) see below: Sue Nicholson has kindly informed me that she reads this small headstone to be that of 'John Grisewold'. Sue also informs me that John Grisewold is listed within the 1673 Hearth Tax Returns. The Hearth Tax, or Chimney Money, was introduced by Charles 11 to raise money to meet the shortfall in the 'Borrowing Requirement'. A form of Poll Tax. Soak the poor! Nothing changes! Image 1 Description Brignall Old Church and burial ground. Image 2 Description The Chancel. Surviving fragment. Image 3 Description Interlace decorated Ninth C. cross fragment built into the masonry. Image 4 Description The old church and burial ground, Brignall. 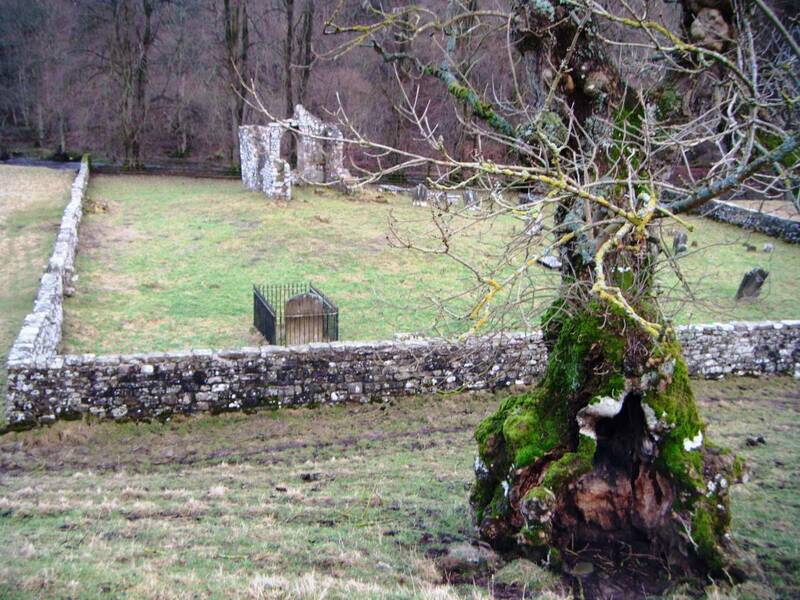 Note the fence beyond the East Gable marking the eroded bank of the River Greta. Image 5 Description 17C Headstone. The Poft Master, Greta Bridge. Image 6 Description Later headstone. 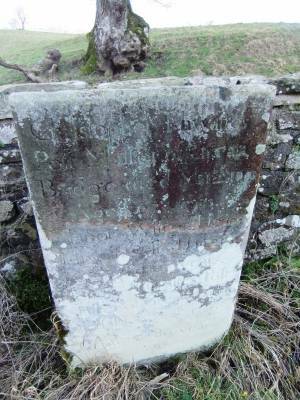 Image 7 Description Evocative but undecipherable (by me) small headstone. Sue Nicholson has now informed me that she has attributed this small headstone to ''John Grisewold'' and that John Grisewold is listed within the 1673 Hearth Tax Returns.